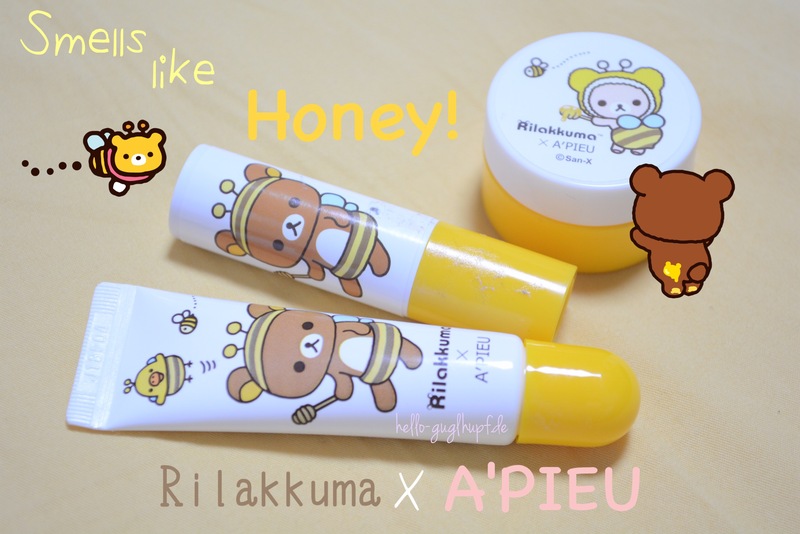 Rilakuma x A’PIEU Honey & Milk Lip Care Products! The main point of this series is lip care! 6 of their products are lip products. 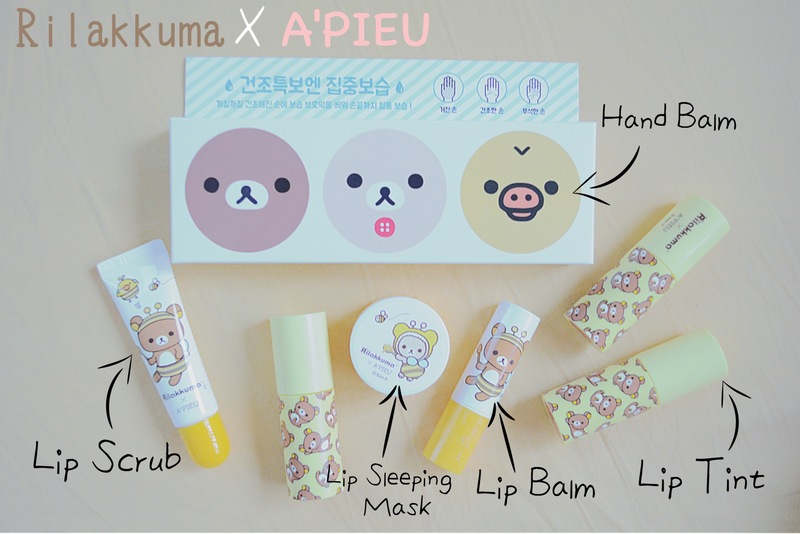 I got the Rilakkuma x A’PIEU Honey and Milk lip balm, scrub and sleeping pack and the set of 3 hand balm and 3 shades of the lip tints. All the packages are so cute! Today I will write something about the three lip care products! 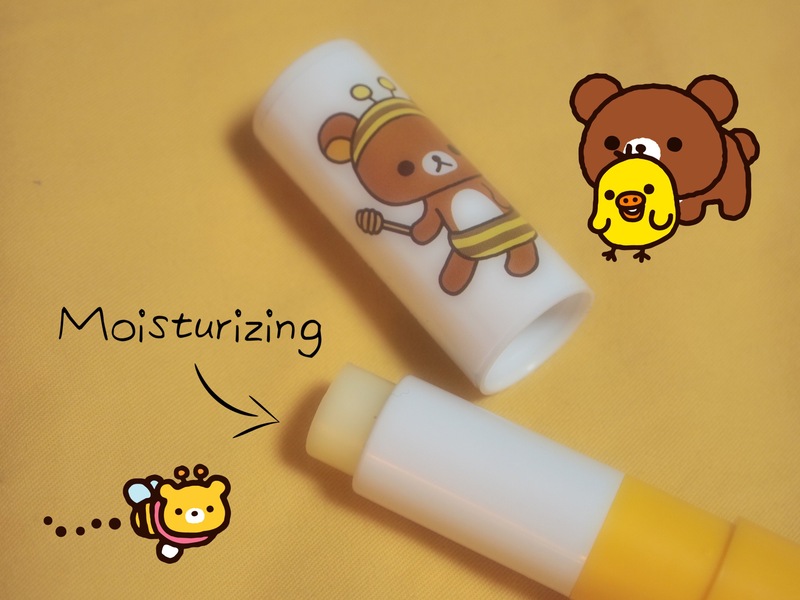 As you may noticed, the lip care products have all the Rilakkuma as a Bee motives on it so you can guess what it smells like! The products smell slightly sweet, I would say like honey! Since the weather is so cold my lips are so dry and I warmly welcomened these products! I tried all of the products once (since I just got them yesterday) and I think they have some potential to become my new favorite products for my lip care! First I tested the lip scrub. I actually only tried lip scrub in my life because I always had small injuries after using it and it was rather harmful for my sensitive skin on my lips than helpful. You apply it on your lips and massage the scrub onto them. After a while you wipe it off or use lukewarm water and get soft lips. I just used it for a few seconds and after I removed the scrub my lips were rosy red and soft. I don’t know yet what will be the long term effect but for rosy and slightly fuller lips the scrub is actually not bad. What makes the difference to other lip scrubs? I guess just the package. I applied the lip balm right after and first I noticed the sweet gentle smell of honey. Just a light hint of honey, not too sweet as most of the fragranced lip balms tend to. The lip balm is clear, more solid and not too fatty, the case of accidentally putting on too much balm can’t happen with this one. I like how light it feels while it’s giving moisture. The sleeping mask has to be on your lips -as the name says – while you sleep, applied before you go to bed. I used it for one night and when I woke up the product was all gone and I wonder if it is my fault by sleeping on my tummy with my face in the pillow or if my lips absorbed all the product. In this case the result would be very negative. My lips were quite dry today and I have some painful cracks on my lips. The cold weather harms my lips and I really need some cure for it! I will give it another chance and will use it again tonight and hope I will not smudge it in my pillow this time. Also I actually were asking myself what is the difference between putting on this sleeping mask and using lip balm before going to bed. 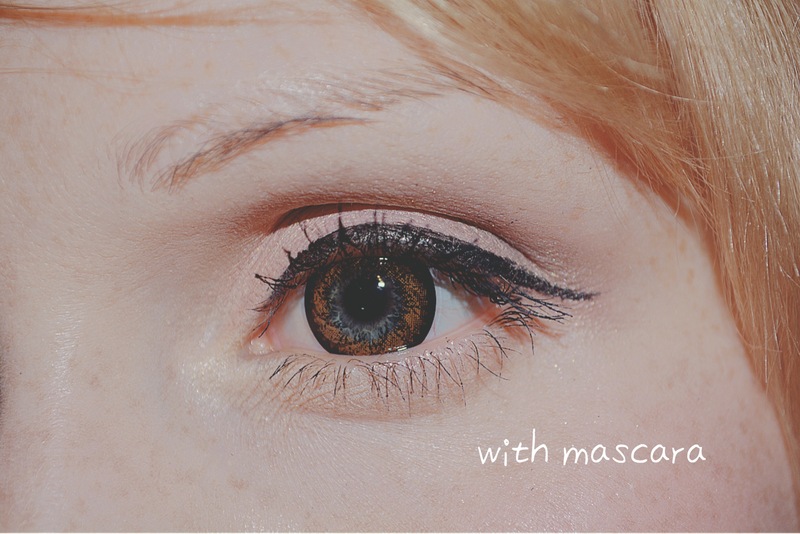 This time I’ll review the Aprilskin Magic-Cara Mascara that I got last time I visited Myeongdong. 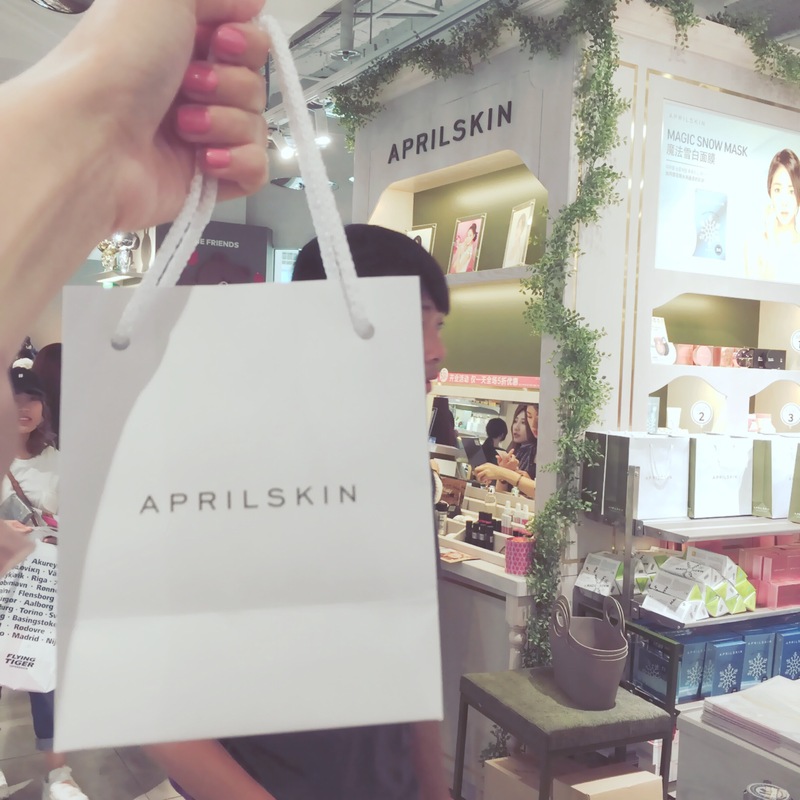 These days there’s a big hype about Aprilskin, especially because they opened their first offline store inside the Lotte Young Plaza in Seoul Myeongdong! Many people streamed there to be one of the first people to buy and get incredible discount at the shop. I visited right on their first days when they had a 50% discount offer and got me a few things from the brand. Btw I got a free mirror because I uploaded a picture of my visit on Facebook. I actually just have one mascara I am using everyday (Dolly Wink) and I thought it’s time for a backup. So I decided to buy the mascara since it is was only 9.000 Won. The Mascara comes with two brushes: one skinny side and one volume side. I totally dislike the skinny brushes because all I tried so far had no effect on my already quite long black lashes. But this mascara has a volume brush too, so I thought if I don’t like this brush as well I can at least use the volume brush. But it should become my new favorite mascara including the skinny brush! The Aprilskin Magic-cara is not waterproof and can be removed easily. It stays all day if you don’t rub your eyes or wash your face. I love to wear it for both, day and evening makeup. The It should be applied in two easy steps: 1. use the skinny side for elongate your lashes and define them. Also your lashes stay seperate eventhough you use the volume brush in the 2. step. 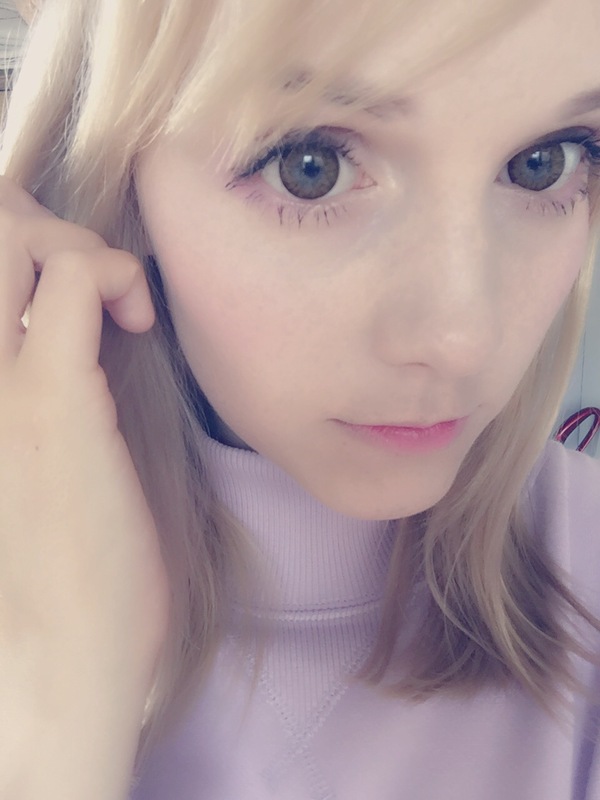 Also, you can reach the inner smaller lashes and also – if you have round eyes like me – the outer angled lashes. Then as mentioned, the 2. step is the volumizing brush that gives a fuller look. If you want to go for a clear and defined look you can just skip the second step. I think the Aprilskin Magic-cara is a really good product regarding the price. 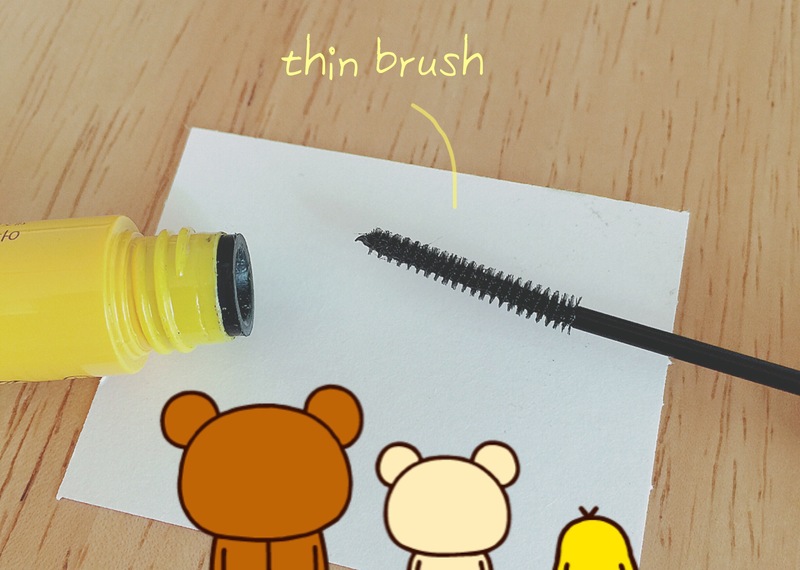 Sometimes the lashes stick together, especially if I am in a hurry I just quickly apply it, but honestly, is there any volume brush that is perfectly separating the lashes while giving volume? I didn’t find that mascara yet. 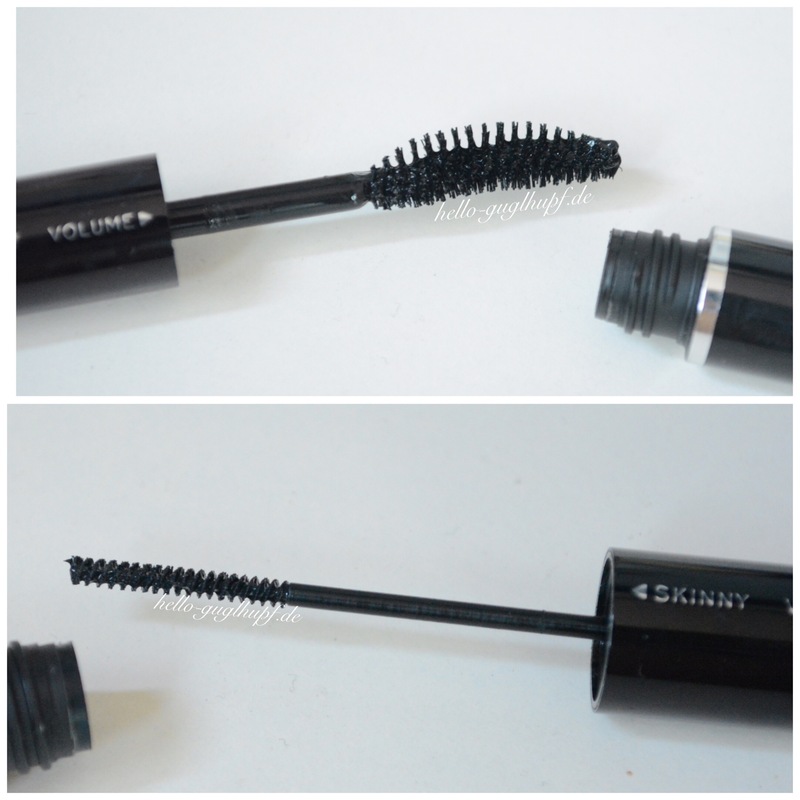 The Price – On sale definitely even one of my cheapest mascaras! 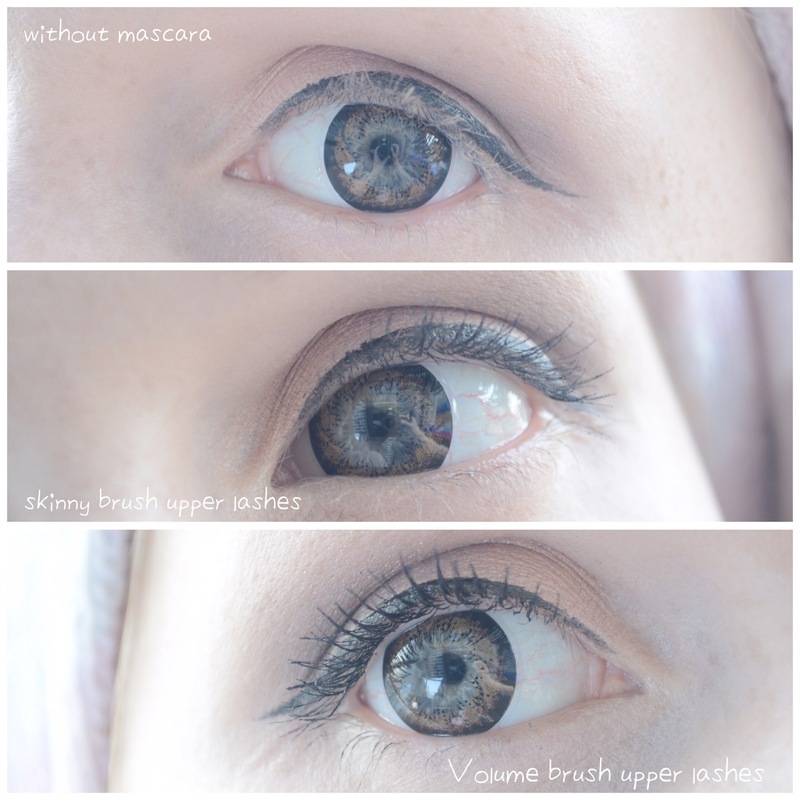 The Effect – Finally I got volume on my lashes without using falsies! 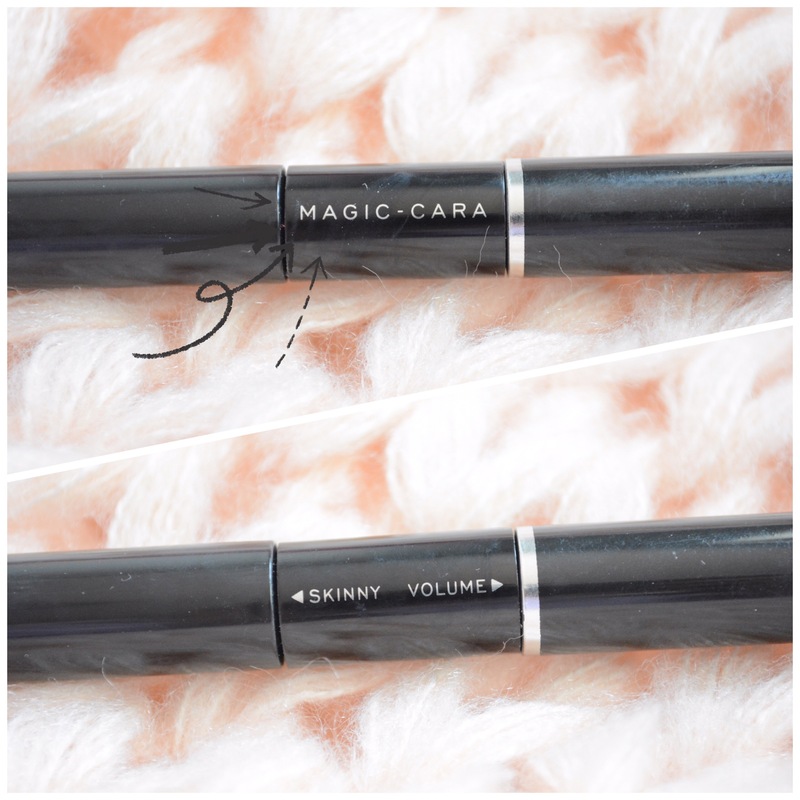 Besides my Dolly Wink Mascara the Aprilskin Magic-cara became my favourite mascara for looks with fuller lashes but without false lashes. This product is definitely one I’d say it is really worth its money. And if the ad is true, it is even a product with natural ingredients. (Aprilskin’s slogan is „Solution from Nature“). If you want to buy one but live overseas you can buy one on their website! I already used it for a while now and created a lot of looks with it. Thank you for reading! 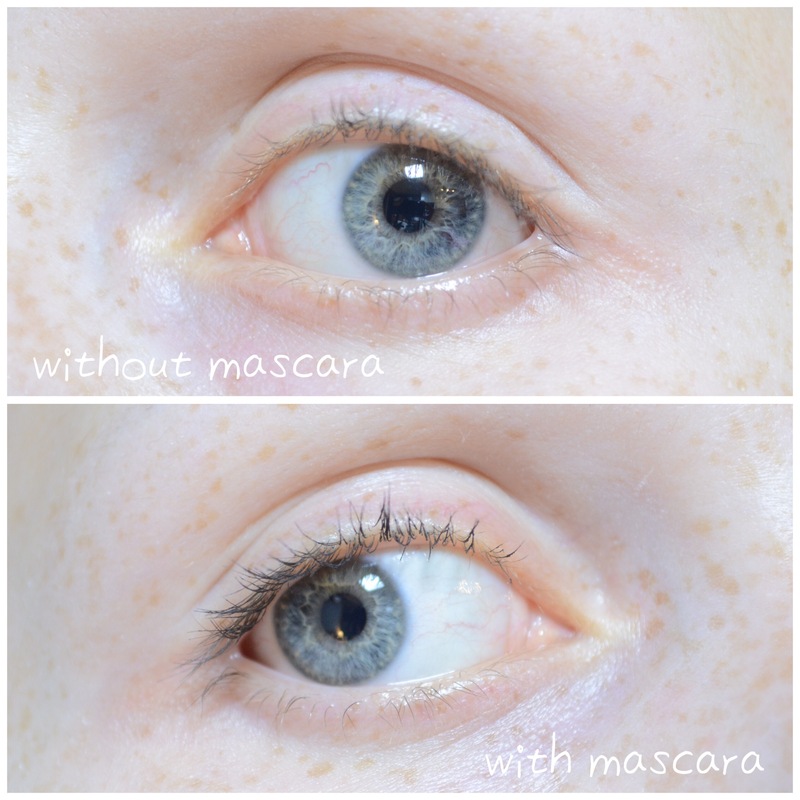 If you need to buy a new mascara – that was my recommendation! See you next time! Hello squishies I’m here today to tell you that I successfully became one year older! (*´꒳`*) I don’t know if this is a good or a bad thing though.. Sadly I have exams and I am not able to celebrate it around my birthday so I just studied and had a nice meal at home. And I also got a cake! It always was my dream to have an icecream cake as a birthday cake in Korea! 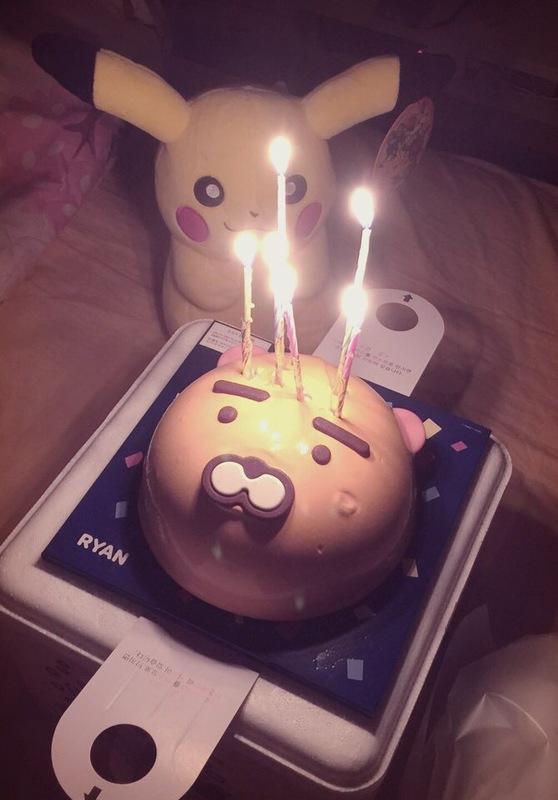 And I got this very cute Ryan cake from BaskinRobbins! 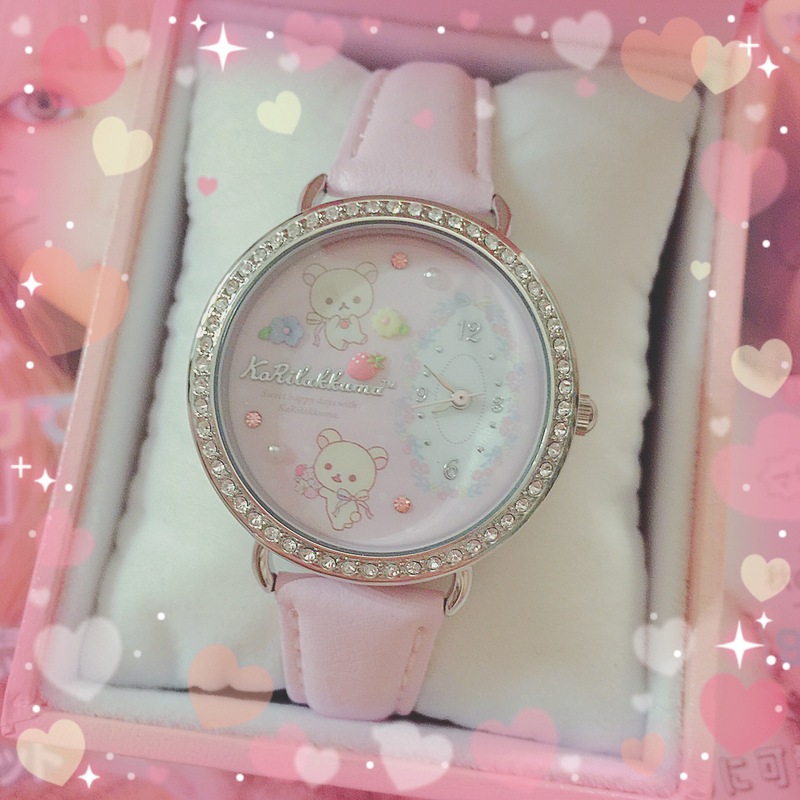 It’s a Korilakkuma Watch! Isn’t it cute??! (๑>◡<๑) I also bought an umbrella and makeup pouch.. I want to buy a new camera too! And then, I decided that a while ago, I want to make a few videos about Seoul as well! Just for having some memories of my last months in Korea before I go back to Germany. There are a few things to prepare before you start a YouTube channel like wether to have videos without voice over and if yes, in which language? Who do you want to reach? How often are you available to vlog, regular uploads are a must. It’s nothing new on YouTube, I really would like to try it though. But let’s see if I can find a good camera and channel name and improve my video skills a bit before that… haha. It’s just an idea. Rilakkuma x A’PIEU Series Part 3! 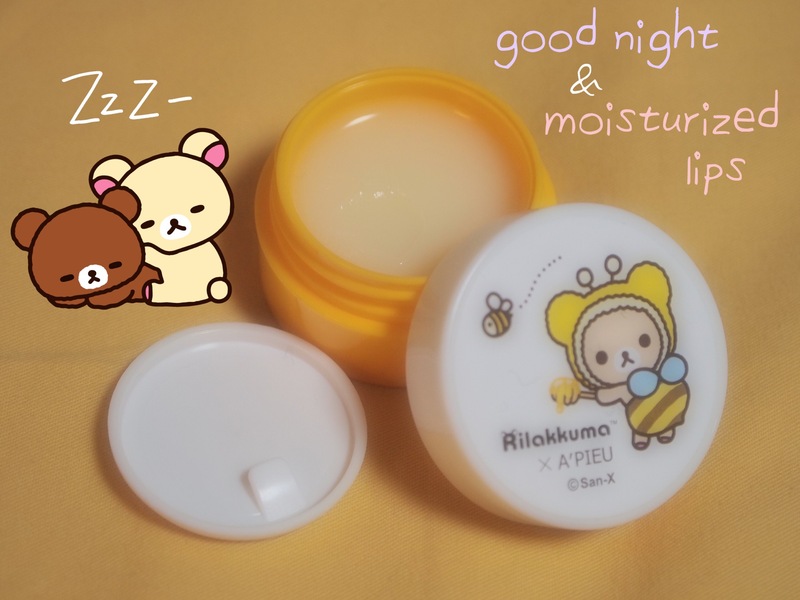 Rilakkuma x A’PIEU Series Part 3 Review! I was so happy when I saw that they are continuing their collaboration with Rilakkuma and his friends and of course I went to the store to get my products! 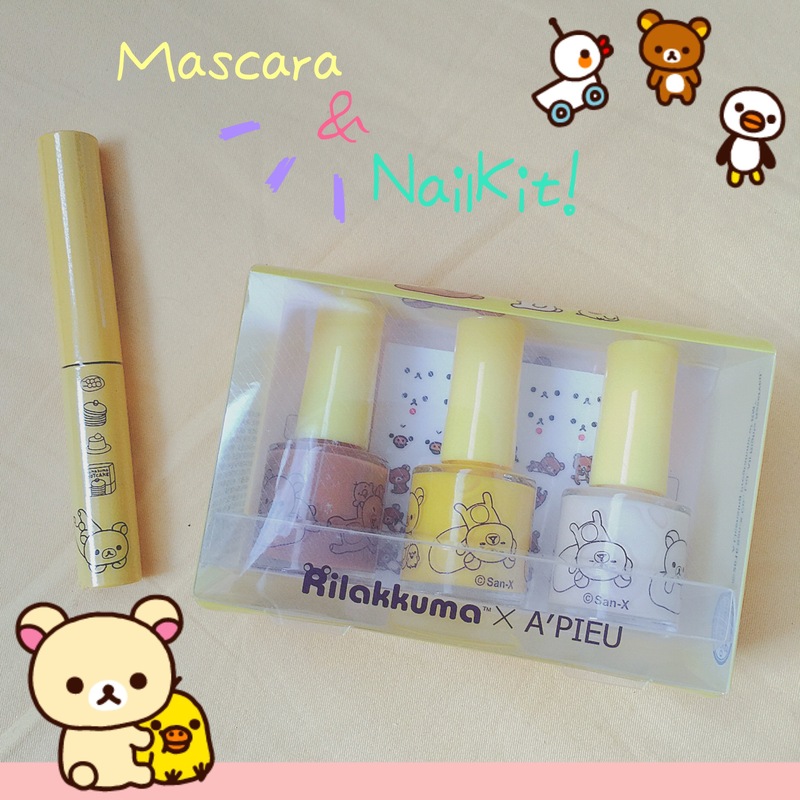 Let’s start with the Rilakkuma x A’PIEU Skinny Mascara in No. 1 Long Lash. The brush is one of these „skinny“ brushes that are said to apply the mascara without sticking the lashes together like glue and make it look overloaded. Actually I didn’t see any big difference. I got darker and a tiny little longer lashes but since I already have black longer lashes it gave barely any effect. 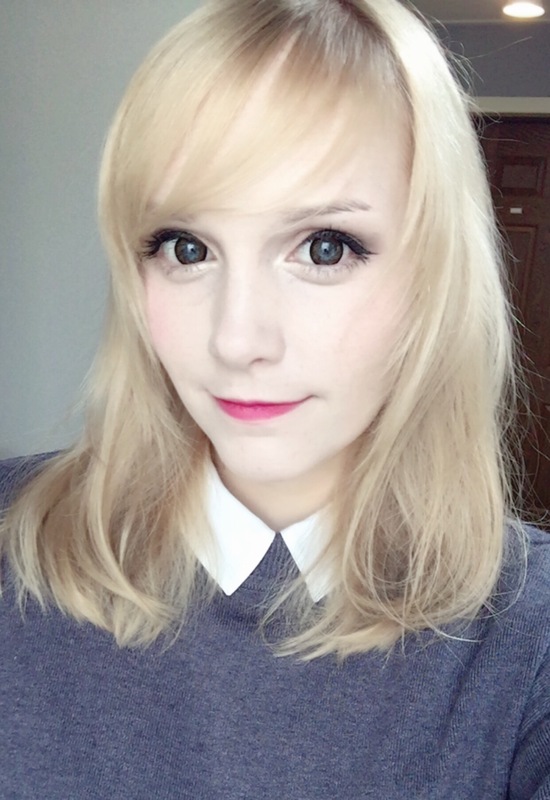 Sorry I didn’t eat makeup in my picture only the mascara and no lenses this time.. While applying it I felt like there was no product on the brush after one stroke. Like the brush doesn’t carry enough mascara. Also after a long day outside and probably some accitential eye-wiping I had the feeling that there was barely any mascara left of my lashes because the end of them became a little blonde as they are naturally. I will not buy it again. It’s cheap, yes but I would rather save the money for a better one. 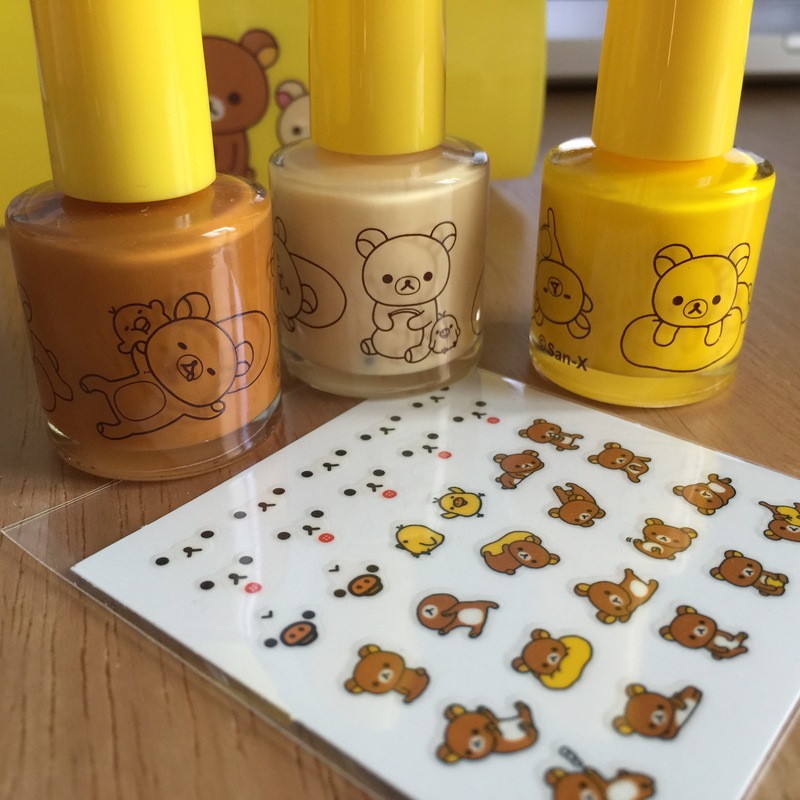 The Nail Color Set includes a sticker sheet and three nail colors in yellow, beige and brown, like the three San-X friends. 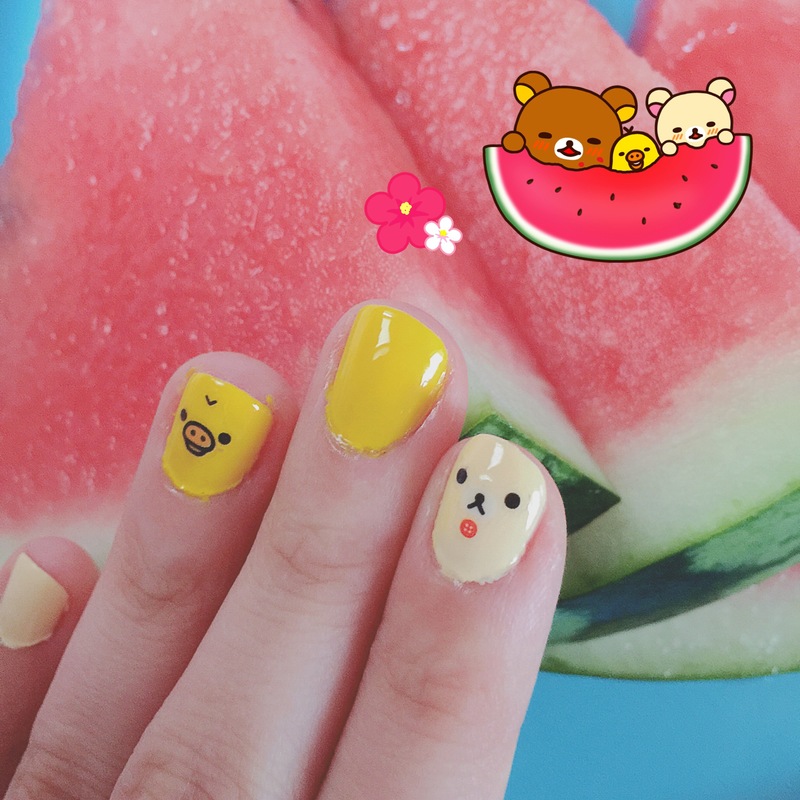 With this set you can create the typical „face“ look on your nails like I did or just create other rilakkuma themed nail art. The colors are nice and bold and dry quickly but there is a twist. Especially the yellow and brown color leave a yellow stain on the nails and it looks like you have some sickness. I forgot to take a picture of my nails when I removed it, but you can imagine that it’s the same with red nail color without a base under it. Omg sorry these messy nails haha I didn’t think it was that bad when I took the photo.. So, when I was visiting again they sold another version of the nail color set – I bought it out of curiousity (without reading what’s inside) to see if it’s different from the first version. 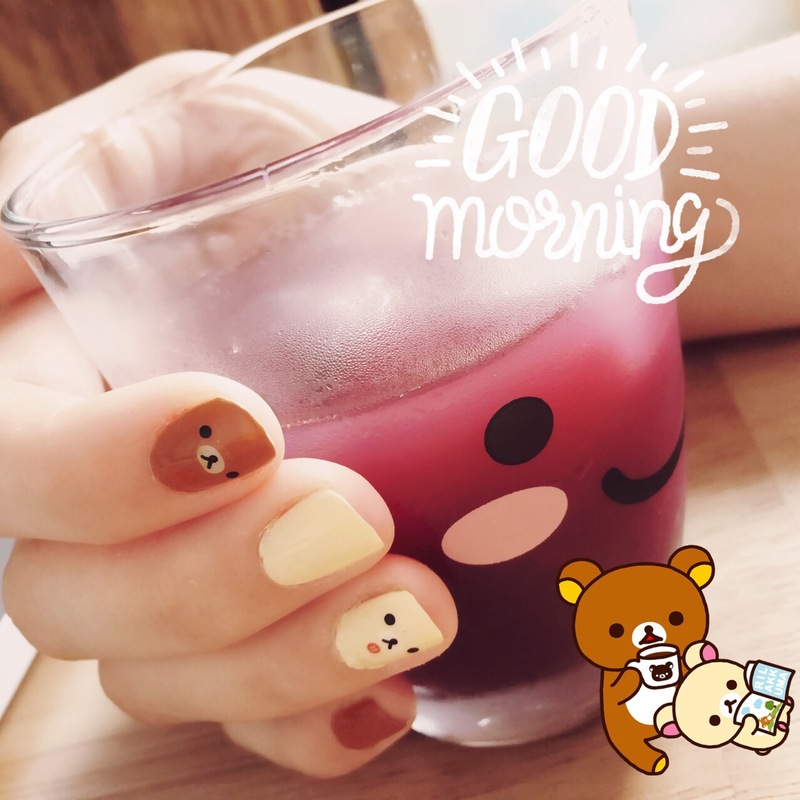 This time the set includes a milky moisturizing fluid, brown color and transparent topcoat nail laquer and a sheet of stickers. So its actually completely different from the first. The milky fluid (Nail Mate Nail Moisture) smells fruity and is a treatment you apply on the nail and skin and massage it until it’s absorbed. For color you have actually only one option: Brown (Glow Nail Touch). The color is similar to the first kit’s one. One time is enough to fully cover the nail without empty lines. It’s a nice choco brown I would also wear without the stickers during the colder months. The top coat is actually not any special, it makes the coat sparkly like you just applied the color and keeps the sticker from falling off. So you should use the kit in 3 steps: Treatment, Color and Top Coat. The Stickers – so cute and easy design! The included Products – I think the products in this kit are much better than the first, since it includes treatment, color and topcoat! For both kits: I think if you are a huge fan like me of the cute little friends you should invest in the nail kit. I like the second one more than the first because I am not using the yellow color that often. I don’t know if it was my own fault, but when I tried to get the sticker off the sheet, it broke into two pieces.. So you should be careful and maybe use tweezers to apply it (I used my nails and fingers). Many asked me where I bought the products and I was surprised how many Rilakkuma fans are out there! ^.^ Of course I will let you know! I bought them at the A’PIEU stores in Seoul! There is one next to Ewha Womans University and one in Hongdae near Exit 9! Lately the products are available at Watson’s as well! If you are living overseas you can still get your Rilakkuma dose by ordering online! 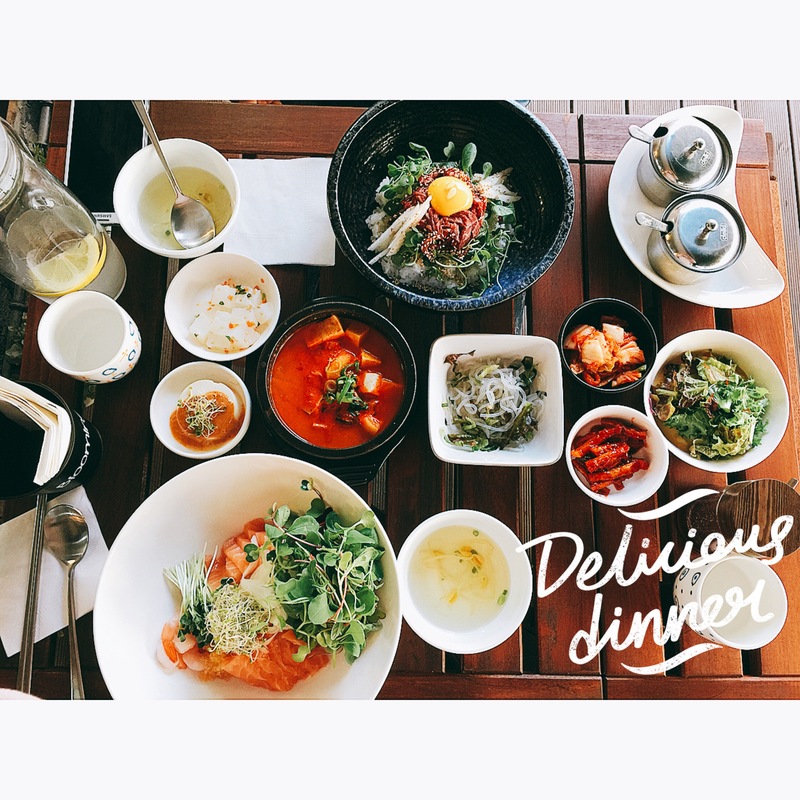 Sorry for the long time of inactivity… This time I will write a little bit about my food experience in Seoul! Oh dear! I gained a lot of weight again since I study here in Seoul and one of the reasons is the yummi food in here! I actually planned to write this post much ealier together with some more informations about my daily life here, but well, I was pretty busy the last month. As promised I will talk a bit about the food I was able to try so far and eating habbits you will definitely adopt. 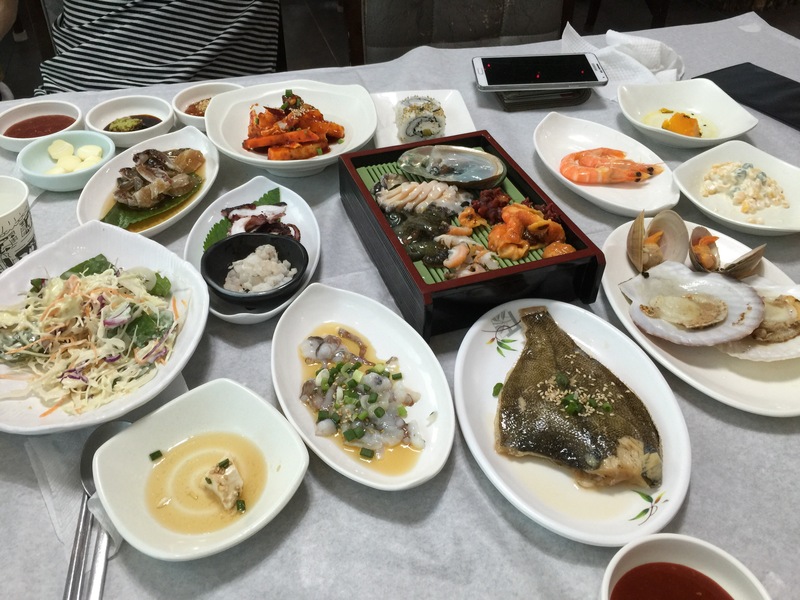 First difference between a European and a Korean table is actually quite nice: As you can see above in Korea the main dish always goes with two or more side dishes. And of course what is the bread and noodles for the German is the rice for the Korean. One of the most different customs compared to my family’s is the fact that you always eat together. And usually not in your home but in one of the many many restaurants out. If you go alone to a restaurant you aren’t even able to eat everything, some dishes are just served for two or more people (like Shabu Shabu). There are of course people eating alone at a restaurant or at home, but the majority is eating together as it is usual for them. You may be stared at if you decided to eat out alone (especially as a foreigner). I experienced, speaking of my korean friends, that even if you are starving to death already since class was over, you still wait for your friends to come out of their courses to go out for dinner. What is also new for most of the foreigners who come here is the fact that you don’t order your own food and eat it by your own, you order many dishes and share them all together usually. 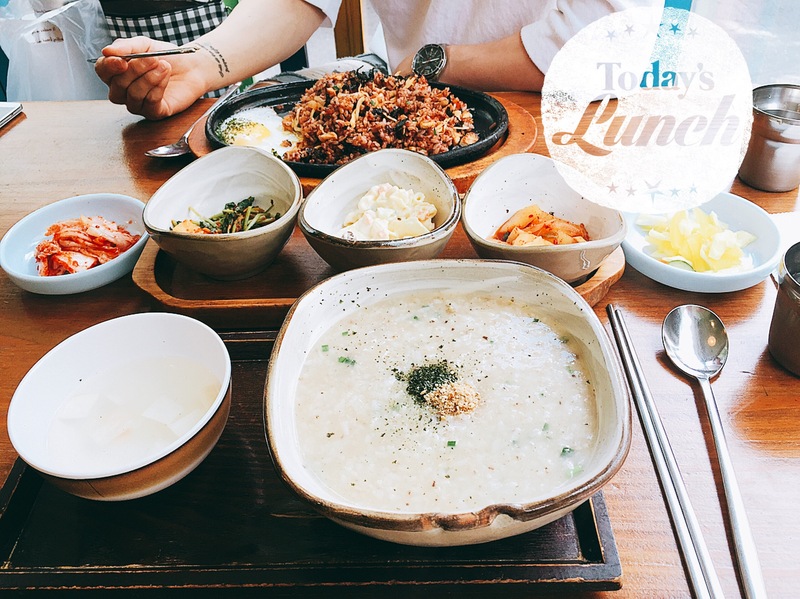 The opposite is the „I don’t have time for eating“ habit, many students don’t eat proper breakfast or lunch, they quickly grab a roll of kimbap at the local convinience store or at the old lady’s booth next to the office workers sipping their strawberry milk. After the first hours of their marathon of studying they just eat some cup noodle or ramyeon the the next convenient or 24h store. But if the risk to lose their seat in the library is too high, some would even skip their meals completely. This is actually pretty contradictory because a proper meal is more important than anything else, according to every korean parent. Another fact is, as a vegeterian you will be left stranded in here because mostly the first question I get asked is „What do you want to eat, chicken? Beef? Or pork?“. You decide which restaurant you are heading for according to your decision of which meat you wanna eat. Almost every restaurant is specialised in some meat dish, but these days the vegetarian restaurants are also gaining more population as we know it from western countries. In general it’s not well seen to order something out of the menu, so you should just choose a dish that is without fish or meat instead. You are vegan? Have an allergy? Then you should probably look up a vegan place or studying the ingredients before wandering around in quest of finding a good restaurant to eat at or just eat at home. It sounds cruel but many people are not accostumed to people saying they don’t eat meat. Drinking and working? For most of us these two actions are not compatible. For me anyway. But if you walk around the streets in Hongdae or Shinchon you can see many office workers trying to make their way home after a drink (or many) with their boss. On monday. And wednesday. 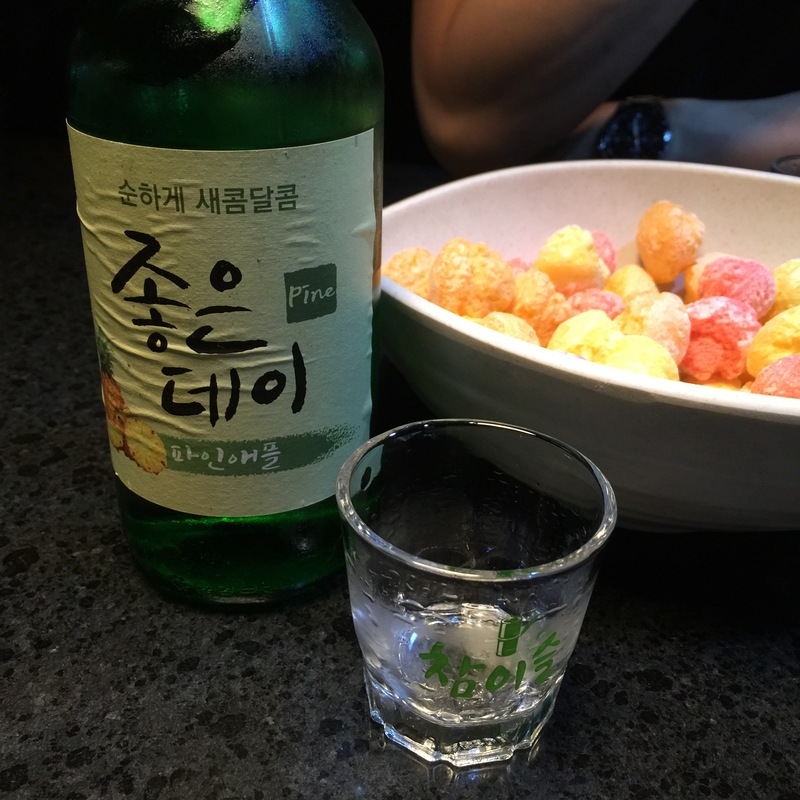 Actually korean drink at any time. 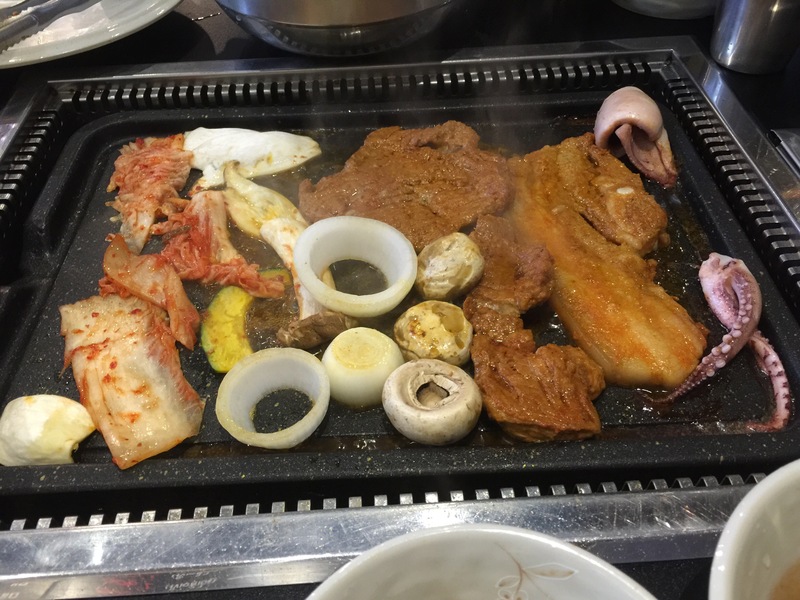 For lunch a bottle of soju or beer makes the perfect combination with their meat. During lunch break? Of course! And on Friday night? Let’s drink until dawn! I had some bad blackouts thanks to alcohol as well in my life but what I saw in Seoul was really terrifying. Girls lying around in their short dresses passed out and weird drunk guys picking up a fight. At 3 am I would say okay, that are the victims of their excessive night out in a club but most of these people are already totally done at 9pm. Okay I may exaggerate a little bit, but it is normal that once a week you go out for having a drink. And here we reach the point I can not understand. 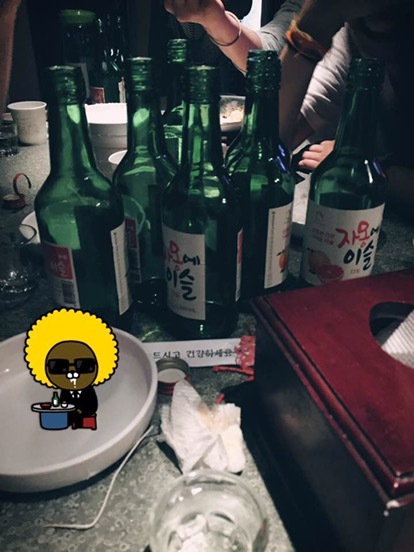 If I would drink think this much as a normal female student in Seoul does, I would have to consider living in here for the sake of my body’s health. The other point is I would gain weight until I couldn’t even fit in international H&M clothes anymore. With every drink usually goes a small fatty dish. There may be a healthy opportunity as well but all I see on the girls tables are fries and chicken or kimchi stir fried rice. Topped with cheese. But most of them wear a European size XS. Not all but most of them. Now someone explain me how their bodies work. Is it the genes? Do they skip the other meals for it? Defenitely some do sports but the majority doesn’t. At this point I have to say I really envy them. Of course they may eat more healthy than European, but if I would eat rice in the morning or as much meat as they do I would still gain weight. The fact that skinny girls are eating chicken and drinking 2 bottles of soju (1 has more than 500kcal) almost every weekend and still fit in the tiny tennis skirt I could just dream of is a mystery for me. Something that underlines this mystery is the coffee shop culture that developed in the city of Seoul. Many many cafés that offer all kinds of sweet sins for your sweet tooth. You go there for studying and meeting friends and – you share a cake or sip on a dairy cup of latte. There are lattes of literally everything. Green tea, strawberry, blueberry, even red or black bean latte. And most of them are calorie bombs that could actually substitute your lunch. 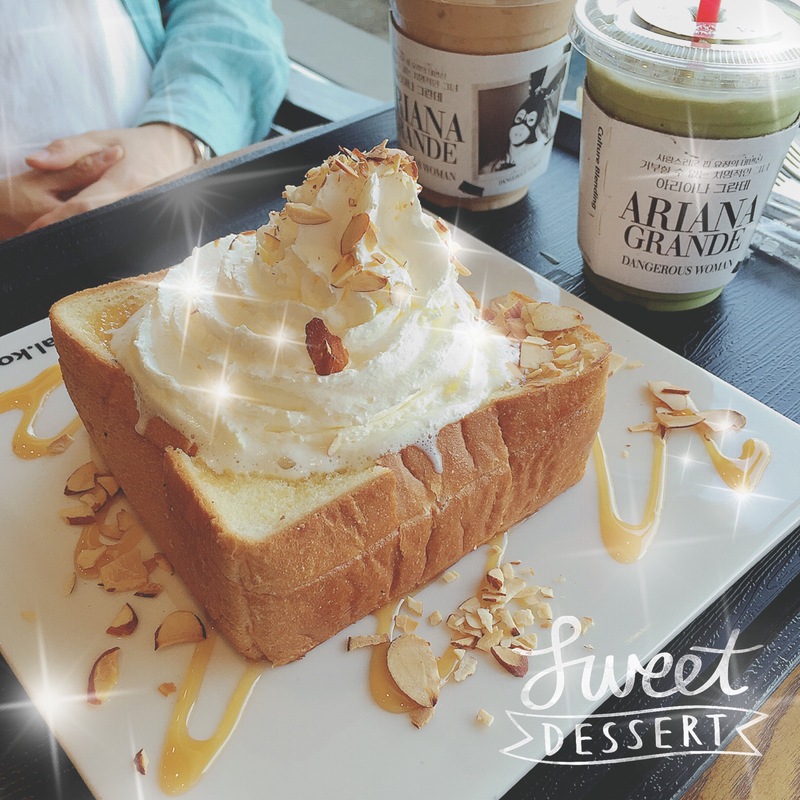 Above you can see a for me totally new Korean honey butter bread! If you ever plan to live here and all the food is new to you, you better bring your running shoes ;) that’s it so far!